We do not use shredded paper for filler, it too, makes a mess when opened. We use some tissue paper and add loose candy. HERE’S WHAT WE DO … and we do it well! We DO USE quality fresh ingredients … Contents vary… but will always be fresh and we promise your gift will be as full as possible giving you the most for your money. After your gift is shipped or delivered you receive an email with the exact photo of your gift. 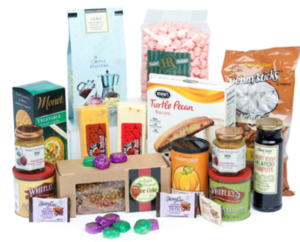 BASIC INGREDIENTS: Fresh Roasted Coffees, Gourmet Teas, Gourmet Cocoas, Jellies, Crackers, Cheeses, Sausage, Popcorns, Nuts, Coffee Cakes, Biscotti, Pretzels, Dip, Chocolates and more! especially for them. You choose the greeting, body text, and closing. If you’d like, your Logo can be added at no extra charge. 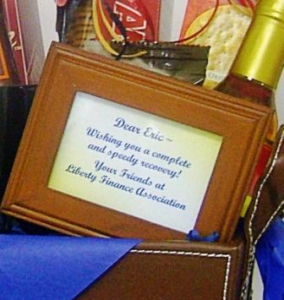 This is especially nice for Business Thank You Gifts. 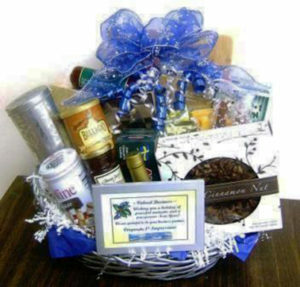 BASIC BASKETS: New Baby, Children, Men, or Women for Birthday, Get Well, etc., Condolence, Thank You, Holidays! BABY BASKET ... How about a Baby Gift that will be enjoyed through the toddler years? Picture is a Step Stool turned upside down filled with a Plush Blanket, Plush Teddy, Popcorn, Baby Wipes, and Personalized Framed Message. Pictured at $100. Can do regular basket baby gifts as well … pricing starting at $35. 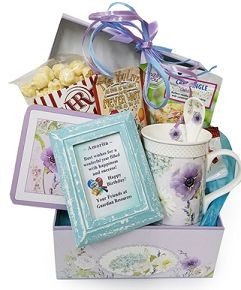 WOMEN BASKET picture is a Floral Lidded Box filled with a matching ceramic mug, spoon, coaster, and gourmet sachet teas, biscotti, chocolates, etc. and personalized framed message. 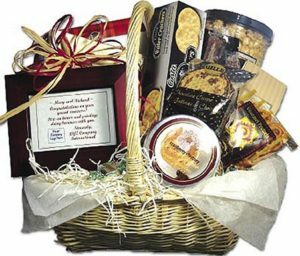 GOURMET FOOD BASKETS used for any occasion. Pictured at $125 … Basic Ingredients: Fresh Roasted Coffees, Gourmet Teas, Gourmet Cocoas, Jellies, Crackers, Cheeses, Sausage, Popcorns, Nuts, Coffee Cakes, Biscotti, Pretzels, Dip, Chocolates and more! LARGE SNACK TRAY used for any occasion. 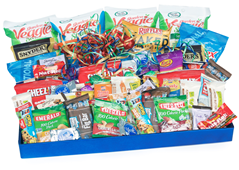 Pictured at $100 … Basic Ingredients: Large Snack Assortment: chips, granola bars, cliff bars, fig bars, cheeze its, snack nuts, small size salted nut rolls, peppermint mint patties, dove chocolates, and more! 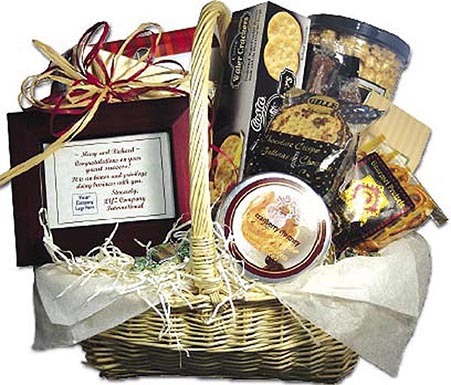 year to year ... ordering Holiday Baskets priced up to $500 ! Will add your Company Logo in Frame Message … no extra charge. 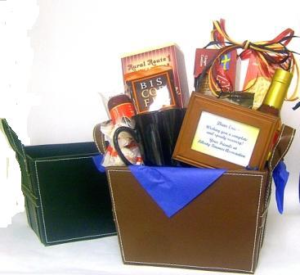 Will prepare your Gifts with ribbon to match your company colors. BUSINESS GIFTS … we incorporate Logoed Promotional Products like Travel Tumblers filled with cocoas/coffees/lemonades and biscotti and Swivel Cutting Boards and stack them up with Crackers, Cheese, Coffees, etc. and a personalized logoed framed message. Shrink wrap it up with ribbon in your company colors. Makes a long lasting useful gift! AND they will remember Your Company every time they use it! Pricing varies on Promotional Product quantities needed. Call 763-913-8793 or Click for personalized assistance … You will be pleasantly surprised how affordable this can be done for you!